From the authors of Heart to Heart and Soul to Soul, this complete program guide provides everything needed for a deep and powerful spiritual sharing group. This complete program guide provides everything needed for a deep and powerful spiritual sharing group. From the authors of Heart to Heart and Soul to Soul, this third volume in the popular series contains fourteen new gatherings on topics ranging from mental wellness and miracles to leaps of faith and bucket lists. Each gathering includes an essay, inspiring quotations, questions, and activities for participants to reflect on at home, as well as a program for sharing about the topics in a small group. A leader’s guide at the back provides instructions and advice for effective facilitation. Using a deep listening method that allows participants to feel truly heard in a safe setting, Robinson and Hawkins continue their rich tradition of helping people gather in small groups and form a sense of community while reflecting on life issues that affect us all. I felt as lifeless as one of those Middle Eastern deserts you see in National Geographic, just hill after hill of hot sand, without a tree or a bit of vegetation to break up the view. My baby daughter had just completed six months of chemotherapy for kidney cancer. She was returning to health; my spirit was not. I had lost all faith and sense of meaning. As far as I was concerned, not only was there no God, there was no purpose. I had no answers to any of the important questions of life. Slowly but surely, my parched spirit healed. The shallow, facile theology that had made up my previous worldview began to fade away. Held in this compassionate group, I was able, one by one, to put together the beliefs that I found to be true and life-giving. In that covenanted group, I could test new ideas by voicing them aloud, while being afforded the privilege of hearing the other group members voice their own tender beliefs. When rough times came again, as they inevitably do, I had developed by then a solid foundation to help me weather the storm. I owned a tested system of belief and an internal strength that was fed by a group, committed to creating sacred space in our time together. Covenant groups are a meaningful path to deepen your life through reflection and relationship. Robinson and Hawkins have shaped an outstanding and easy-to-use guide for individuals and groups at any place in their theological and spiritual odysseys. 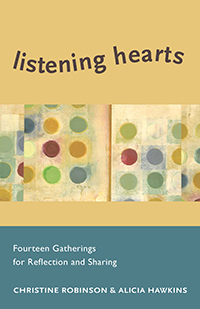 With engaging prose and poetry, challenging and insightful essays, inspiring quotations, and penetrating reflection questions, Listening Hearts composes a private and shared liturgical score to bring vitality to anyone’s life. If you, your covenant group, or your congregation’s small group ministry is searching for a way to begin, begin again, or go deeper, then your search is over. This is the book for you! This book, the third in a series by Christine Robinson and Alicia Hawkins, is a welcome addition to their previous works. I found myself deeply engaged while reading Listening Hearts, a skill we all need to foster. The opening ritual, covenanted ways of being together, group sharing, and a well-written and thoughtful “Consider This” piece in each session not only deepen the participants’ experience with each other, but promote their spiritual and theological maturity. I recommend it for congregations of all sizes and firm persuasions. It can open us to new possibilities together. They've done it again. Christine Robinson and Alicia Hawkins have written a third in their series of books aimed at providing rich resources to those seeking guidance as they explore the depths of their lives. Listening Hearts provides the kind of fertile material needed to nurture profound personal growth. The well-crafted session plans might be enough on their own, but Robinson and Hawkins also offer deeply insightful meditations on each of the fourteen themes in the book, as well as activities and questions to help people engage more fully. These are so powerful that even before gathering together, participants will touched and moved. Even individuals who are not part of a group will find the session plans to be great jumping off places for their own journaling or other spiritual practices. If you’re looking for aid in opening your own heart further, Listening Hearts is a good place to start. Robinson and Hawkins continue to deliver themes, reflections and questions that can both re-energize a covenant group program that's losing steam, or jump start a new program. With several options now out there for covenant group resources, this book collection offers the convenience of an easy-to-reference text, an overview of the year of sessions, and a digestible leaders' guide. The well-chosen session topics, the sparkling writing in the essays, and the evocative questions the authors pose invite depth and authenticity from participants.